Ageing affects each of us differently. As we grow older our bodies go through many different phases depending on our hormones and how much we indulge in life’s excesses. To help you understand these changes better, we look at what happens during our thirties, forties, fifties and beyond. Plus, we give you tips for an optimal appearance at every age. WHAT’S HAPPENING IN YOUR 30s? 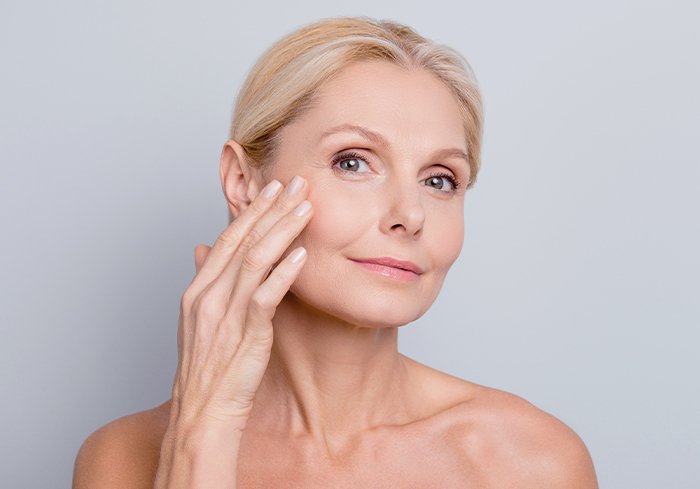 Early signs of ageing may be noticed due to collagen loss. This may cause fine lines and wrinkles to form and dark circles under the eyes to become more prominent. At this age, sun exposure is the most common but preventable cause of accelerated ageing. Active lifestyles with sun exposure can lead to premature sun damage, pigmentation and broken capillaries. Prevention at this age is the best tactic. We recommend trying anti-wrinkle injections as a preventative measure to stop wrinkles in their tracks before they turn into deep lines. Also, invest in regular facials like Ultraceuticals’ radiance boosting A-Zyme or Radiance+ Plus peels. This will help to correct early signs of ageing and refresh, refine, hydrate and plump the skin. And always use a sunscreen to prevent sunspots and premature ageing. We recommend using DMK Soleil Defence 50+ Sun. WHAT’S HAPPENING IN YOUR 40’s? Your skin is more vulnerable to environmental pollution and sun exposure at this age. Plus, over the years, UV exposure may have caused sun damage in the form of broken capillaries or sun spots. You may also notice an increase in the size of your pores. This is caused by your skin loosening and the opening of your pores becoming more pronounced. As the lymphatic system starts to slow down, you may start to notice that volume loss is giving you a hollowed or tired look. Unfortunately, this can also lead to fat accumulating more easily around the abdomen, hips and thighs. At this age, we recommend experimenting with laser and light-based treatments. Our IPL treatments will help to even out your complexion by reducing pigmentation and redness, whilst also giving you a boost in collagen. For something even more in-depth, our Fraxel® treatment can also greatly improve the texture of your skin while also effectively treating mild to moderate wrinkles, enlarged pores and scarring. Anti-wrinkle injections are also great for banishing those fine lines and wrinkles, or you can try collagen stimulating injections such as dermal filler to give your face back its youthful curves. And for the stubborn fat that just won’t budge, you might consider investing in a body contouring treatment like CoolSculpting™ or TruSculpt® 3D. WHAT’S HAPPENING IN YOUR 50’s & BEYOND? At this age, your skin is more dehydrated than earlier years. Plus, collagen and elastin deplete faster than our body produces them. As a result, skin becomes thinner and slacker and appears to have lost structure. For women, menopause often begins at this time and decreased estrogen slows sebum production, making it appear dull and dry. At this age, treatments that deliver long-lasting results are your best bet. Skin tightening treatments like Thermage® and Ultraformer III can help to tighten and smooth sagging skin, while long-lasting injectable treatments such as thread lifts and collagen rebuild injections can help to restore volume and hydration. At Artisan, our highly qualified team of doctors, nurses and dermal therapists will work with you to develop a customised solution that takes into account your age, skin type and skin concern. If you’ve noticed changes that make you feel less confident about your overall appearance, book a consultation with our masters today. We’ll help you master the artistry of you™.